SEMrush offers online marketing software that helps companies manage their SEO, PPC, and other digital marketing processes and projects. SEO Surgery is a popular YouTube series from SEMrush. The format for SEO Surgery is that of a roundtable discussion. SEMrush brings along industry experts who then share their opinion on how websites can be improved through SEO. All this happens in real time with a modicum of prior preparation and is exciting to watch, especially for the rabid SEO Analysts! Companies like SEMrush and Ahrefs have slowly made inroads into the Indian SEO ecosystem and SEO Surgery in India editions evoked keen interest in Indian SEO and Digital Marketing aficionados. For more SEMrush related content, check out our post SEO for the Diwali Season Summed Up in One Image. On August 23, 2017, during the 3rd edition, it was the turn of the PrintStop website to be surgically dissected. I was intrigued when Yogesh Sarade, the Digital Marketing Manager at PrintStop and our client contact messaged me the news along with the video of the SEO surgery. Since Opteamize manages the SEO for PrintStop, this was an opportunity to know from experts on where we stood. There was a touch of anxiety too! Despite knowing that we had done well with the website since taking over as their SEO partner in June, there were many areas that we had not ventured into. Our primary focus had been overall site speed improvement, on-page optimization for selected keywords and getting their dormant blog up and running. Typical of many SEO partnerships, the client was managing the technical changes on his own with the help of a 3rd party web development company. While this precluded us from fixing some of the issues ourselves, it gave us the liberty of spending more time to dive into the overall content marketing strategy for the company. You can watch the video for yourself. The PrintStop portion starts at 28:17 and ends at 40:35. Now, for the feedback and our feedback and learning from the feedback! Here’s the transcription of the video in question. Watch the video and follow along with the transcript (italicized). Comments from us at Opteamize, which aren’t in the actual video, appear in a darker hue (bold). It’s time to kick off this SEO Surgery. Now, without wasting any time, we will be covering printstop.co.in, office printing super easy and hassle-free. Lukasz Zelezny from Switch.com will do the website audit for PrintStop. 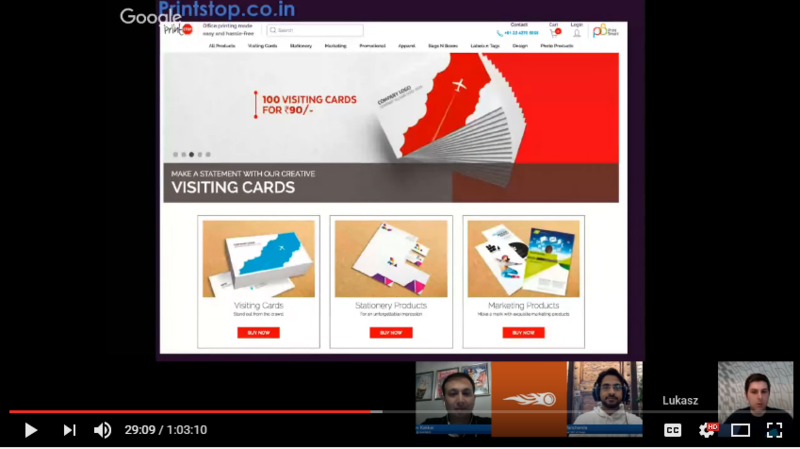 Lukasz: printstop.co.in is a kind of Vistaprint competitor for the Indian market, with lots of visiting cards, business cards, and stationery products you can order there. Where I started is using DeepCrawl, a cloud-based crawler. According to DeepCrawl, the primary pages is forty. There are 1400 pages already indexed, so something must be wrong if the primary page is only 40 and Google is indexing so many. I went deeper and found that design page is where the thin content was indexed. These are customized product design pages with some basic PHP with some parameters already indexed. This is mainly because there are a lot of question marks after Dot PHP and the query strings are indexed which cause potential problems. These pages should not be indexed. These pages should be nofollow or canonicalized. 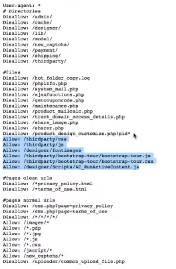 It isn’t clear how DeepCrawl arrived at 40 Primary pages. 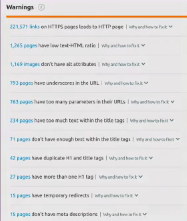 Is it – each and every unique and indexable URL? If so, there are more than 40 unique URLs and landing pages. Since we prefer to use Screaming Frog rather than DeepCrawl, perhaps somebody can explain this better. An interesting coincidence is that Opteamize has focused on 40 top landing pages; perhaps there lies the answer! There should be nofollow or at least there should be canonicalization done because I went to the source code and it wasn’t done there. 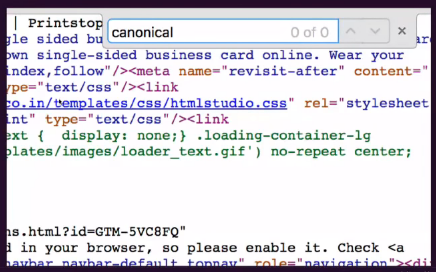 There wasn’t noindex and nofollow canonical tag. Plus, there were other things the crawl had been able to catch. I found duplicated pages, duplicated page sets, duplicated titles, so on and so forth. These things should be fixed as soon as possible. Some people think this is just a fluke and unimportant. I am always trying to make sure that my websites are optimized almost perfectly. Whatever I can, I am trying to optimize just to make sure there are minimum issues and problems. Sometimes it’s impossible to fix some issues, but those are special cases. Whilst we agree with Lukasz’s comments, sometimes it’s a question of priority and willingness to live with minor technical issues particularly if they aren’t affecting the site too much. Following the SEO Surgery date, we have upped the ante on and worked hard to eliminate the duplicated titles and pages. This has resulted in an increase of indexed pages and overall results also have accordingly improved. Thanks, Lukasz! Then I went to SEMrush and I performed another crawl. SEMrush reported 4040 pages. 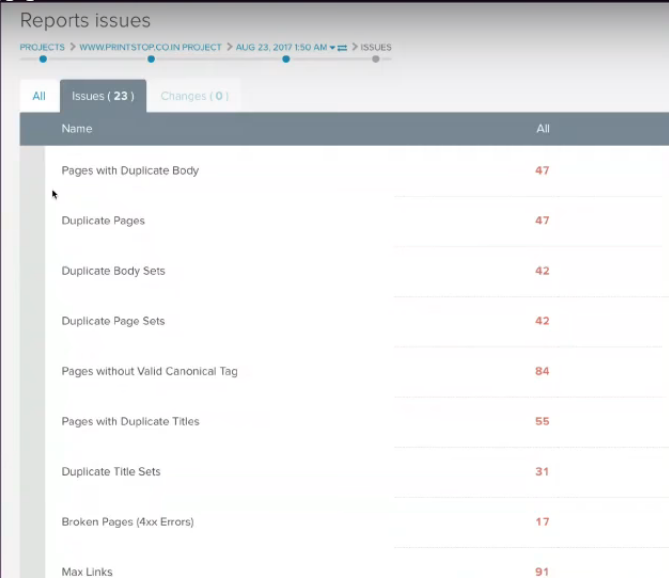 Both DeepCrawl and SEMrush are using different methodology, but both tools are giving a strong signal that there is potentially something basically wrong because so many pages have been indexed. I went deeper, and again, there were lots of redirection chains and duplicated title issues because of duplicated content, obviously. There were 221,000 links on HTTPS leading to HTTP, which is called mixed content. Normally, WordPress, for example, can fix this very quickly but PrintStop is not using WordPress at the moment. That potentially looks like a crazy number, but that probably includes a couple of links that are sitting somewhere on the footer or header and always linking to HTTP, however, they should link to the HTTPS version of the website. Discussions were already in place to migrate the site from HTTP to HTTPS well prior to the SEO Surgery date. The transition has since been completed by PrintStop. Then I analyzed the competitors to see if there was anything they were doing to help us become stronger. I chose Flexiprints and Overnightprints to see if they could help us. 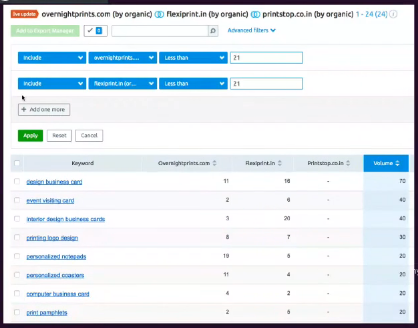 So I went to the keyword gap analysis or domain vs domain to see the keywords where Overnightprints and Flexiprint rank between one and twenty, which is the first two pages of Google, and PrintStop doesn’t. 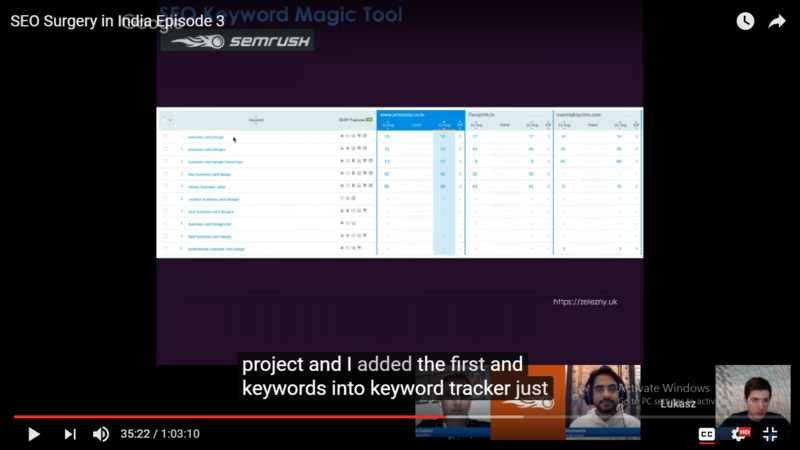 I chose ‘design business card’ as the main seed keyword and then I went to the SEO Keyword Magic tool. I intentionally chose India because obviously, this is a website operating in Indian markets. 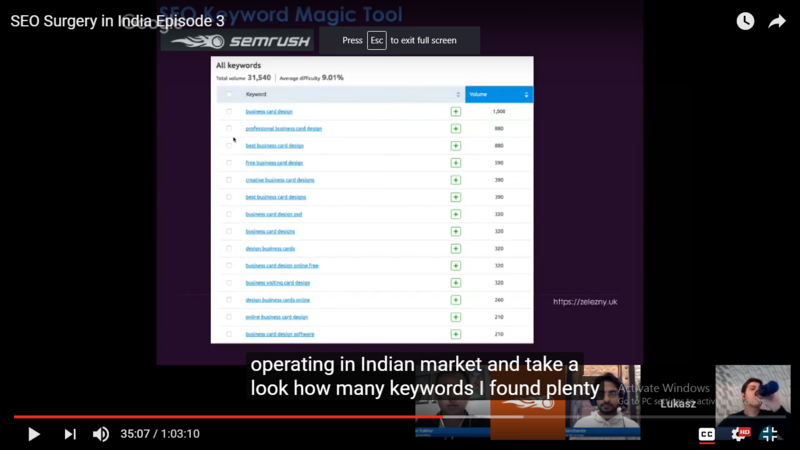 Take a look at how many keywords I found. I found plenty that contains the seed keyword ‘business card design’. What I did next entered the first ten pages into Keyword Tracker just to avoid cannibalization. As you can see, five of the business cards I chose related to ‘business card design’ are already ranking and PrintStop is doing quite well. At least I would say this is a good starting point so I would generally check what URLs are triggering and start on-page optimization. 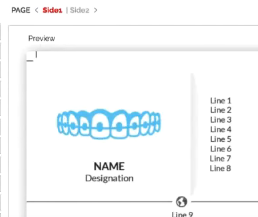 You can start with the simple ones, like adding title tags and expanding content. Also adding some relevant pictures with relevant alt-text. A couple of these things, we are always doing like H1 and H2 tags modification. Also, keywords six, seven, eight, nine, ten, which were not ranking, and probably we should consider either adding this keyword to existing content or create new content. Note that the search volume mentioned above was very low, hence those keywords are not very relevant. 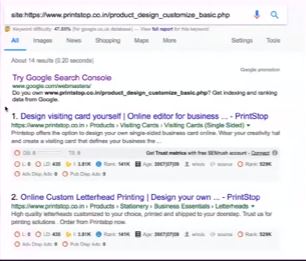 Upon analyzing 6-10th keyword mentioned above, only business card design has sufficient search volume and it is already covered by our SEO Keyword contract and ranking high already. This is the robots and you can see this. (Highlighted portion). We don’t like this directive because this directive doesn’t exist! There is no such thing as ‘allow’. There is only disallow. I wanted to cover this as well. That (allow) doesn’t make any sense. There is only disallow. Varvy is a tool developed by Patrick Sexton, a highly respected figure in SEO circles and we can certainly vouch for his credibility having used the Varvy tool especially for auditing landing pages. 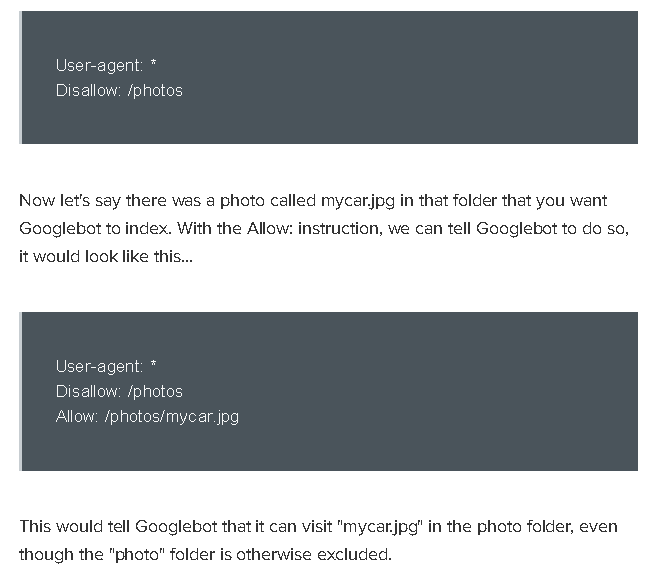 Further, we did an analysis of the history of the robots.txt files of printstop.co.in to find what changes had been made and who had made those changes. At Opteamize, we are loath to make too many disallows as we want to squeeze every bit of SEO juice. However, Lukasz’s comments got our creative juices flowing and fixing the errors on the Search Console was a good treat for this old SEO dog! We also used oldrobot.org developed by @KiwiAlec to get the history just to check how often the Robots.txt was updated earlier. 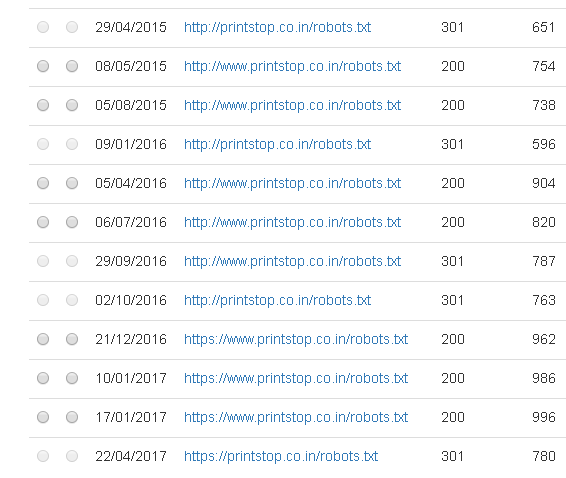 We then worked with PrintStop to tweak the robots.txt file. A total of 2 iterations helped to fix some issues mentioned above and also increase the number of indexed pages. The robots.txt was first updated on 6th September 2017 and was again updated on 9th October 2017. Now for the next portion of this SEO Surgery. Here are some additional points from Vaibhav Kakkar, Co-founder of RankWatch. Let me cover a couple more points here. First of all, the site has some pages like the login page and the forgot password page which are all getting indexed. It is a small thing but perhaps they should take care of this. Then, what I see here is they have some of the URLs, like this (left) is one of the indexed URLs I picked up from the site. This (right) is another indexed URL. So, these are almost duplicate URLs, plus they have the temp ID so maybe they should exclude the temp ID from the indexed URLs in the Google Webmaster Tools. Good feedback. This was duly implemented. This is a usability aspect. When I am calculating the price of certain products, the price does not match. The price was not changing for most of the things I was selecting. The calculator was a big, long calculator, so they can take care of that. The comment is inaccurate. 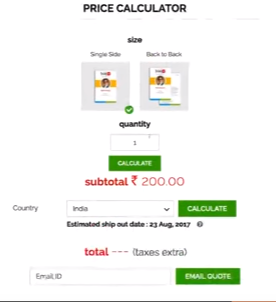 ID cards have a fixed total price of Rs. 200 for quantity 1-5 (it is written on the page content also) and only after that it changes. From a UX perspective, have also suggested adding a note that makes this clear to the user. This is under consideration. The titles are quite long, so Google will cut them short. So, the amount of priority given to the first part of the title will be more, so maybe they should look into that as well. A complete report of the long titles i.e >70 characters was submitted to PrintStop for fixing. The list has since been drastically pruned. Thanks to our client PrintStop for initiating some follow up actions on their own and for quickly implementing suggested changes. A final note of thanks to the SEO masterminds at SEO Surgery for sharing their superior knowledge with others. SEO is a tricky subject with a steep learning curve and has sometimes a bad rap as too technical or in other cases too much backlink driven. Only a true SEO lover can understand the hard work and dedication that goes into White Hat techniques. May SEO Surgery continue to crank out episodes. Keep the good show going. Our Director, Srinath Ranga recently conducted a similar exercise at iKeva, Mumbai. Here’s a short snippet. Do you want your website to be optimized for search engines? We can perform an SEO surgery of our own and offer SEO services that will get your website pages ranking at the top of the results. 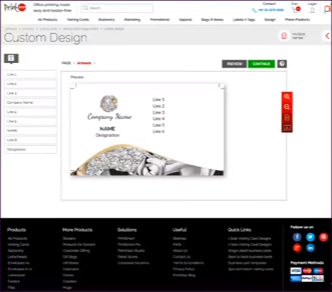 Optimize your website with Opteamize. Contact us now! A nofollow link can also directly lead to someone spending money on your company’s products or services. If you consistently create awareness and engage with people, those nofollow links may earn you way more than domain authority.